Yes, Finicky has won another prestigious award and proves again that our quality and service are top-notch. Read the attached PDF to find out the full story. 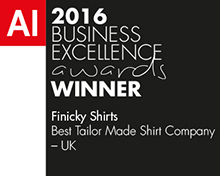 Online bespoke shirt retailer Finicky Shirts has been picked out from thousands by founder dragon of BBC’s Dragon’s Den – Theo Paphitis. The weekly Twitter competition ‘Small Business Sunday’ was started by Mr Paphitis to recognise the efforts of innovative small businesses requires entrants to ‘pitch’ their business in 140 characters or less. “Bespoke tailoring and made-to-measure garments traditionally involve all the time of multiple visits to your tailor, not to mention a hefty price-tag” explains Finicky founder David Buisson. 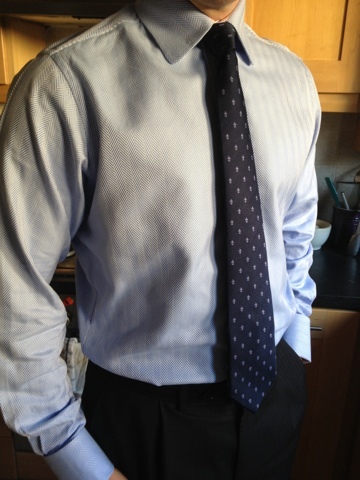 “We wanted to convey with our tweet, however briefly, that the beauty of the Finicky Shirts service is that it does away with all that hassle and expense – providing choice, high-quality tailoring and we even deliver right to your door! Finicky Shirts provides an online service that allows customers to enter all measurements, finishes and bespoke specifications to create the perfect shirt. This is then handmade by the Finicky Master Tailor and delivered anywhere in the world – all for £69.95. Gift vouchers are also available and are always very popular in the run-up to Christmas when thinking of the perfect gift for that difficult-to-buy-for man in your life. 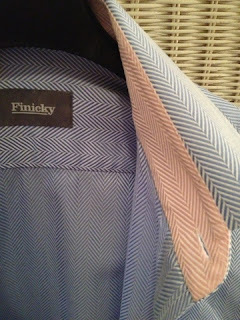 Find out more about Finicky at www.finickyshirts.com or for press enquiries, contact David Buisson on info@finickyshirts.com. David Buisson recently appeared on Brooklands Radio. The team at Finicky are proud to announce that we are featured in the latest edition of the exclusive luxury lifestyle magazine, Premier. The publication is posted out directly every three months to homeowners in only the SW3 and GU/KT postcodes and promotes only the finest local independent businesses to a discerning, affluent audience. Turn to pages 14 and 16 of the latest edition to see Finicky. If you want to turn out like the gentleman shown here (and let’s face it, who doesn’t?) without breaking the bank on Saville Row, here are five good tips when looking for an off-the-rack suit on the high street. There are many measurements to consider when finding a suit jacket that fits, but you must make sure you concentrate on these three at the very least: the chest, the waist, and the shoulders. Given the way in which suit jackets are sized – that is to say, chest size-by-length – even the most clueless buyer will be fleetingly aware that the chest is an important area. Amazing, then, that so many still get it wrong. It’s quite simple, really: make sure your lapels lay against your chest when the jacket is buttoned, not too tight, but certainly with no gaping space. A few weeks ago, our Beauty Assistant Maria Glendinning made her other half George very happy (and made him look very smart….) when she ordered him a custom-made shirt from Finicky Shirts. George got to choose the perfect style, collar shape, cuff design, fabric pattern and colour, then Maria got busy with the tape measure – and sent off his measurements on the Finicky order form. 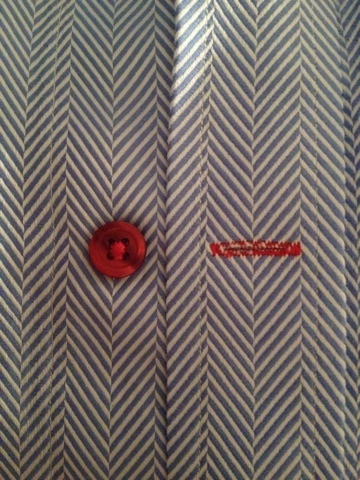 Three weeks later, the beautifully-made shirt arrived (beautifully-wrapped too) and it was definitely worth the wait. The design you choose is completely up to you, you can go classic or as creative as you like, Finicky has every option available. And the personalised service really does make it the perfect gift. 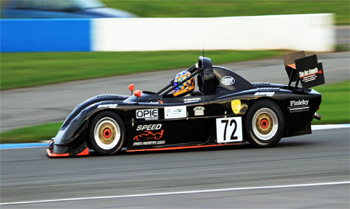 Finicky were pleased and very proud to support Graham Hill and the team as they enjoyed success recently at Donnington and Brands Hatch. Designer Shirt for your Wedding Day? Designer Paul Smith said recently that no male wardrobe is complete without the perfect white shirt. 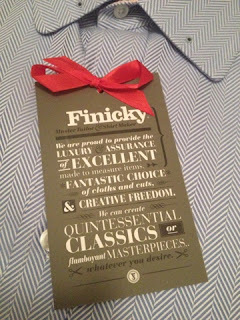 Now bespoke online shirt company Finicky can provide classic white; black tie; wedding or contemporary casual shirt made to measure just for you - and all done online. Simple, fuss free and the results are amazing! Check out the rest of the story and competition on p.66 in the fabulous Absolute Bridal magazine. Although I absolutely love Christmas, I can’t say I am a big fan of Christmas shopping. I tend to a adopt a Victorian approach of bringing home a few select presents for the nearest and dearest on Christmas Eve, following a late scoot around the shops for some last-minute hunting and gathering. However, I have to say the internet has revolutionised my shopping habits. Searching out the best bargains online is certainly a bit easier than the battlegrounds that become some of our big-name stores. You can also find some fresh ideas or a special twist on a traditional Christmas gift. For example, shirts seem to be a staple fixture on the list for many a male relative, but with a bit of searching on the worldwide web I found something just a little different – a made to measure shirt you can order online in all manner of colours, sizes and styles. 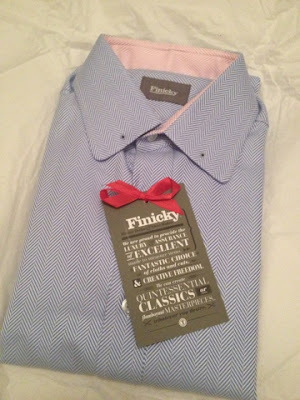 Finicky is a London-based master tailor and shirt maker, but the website is easy to use and with the choices available you are guaranteed to find whatever you require. The shirts also arrive in a stylish wrapped and tied finish, so for the Victorian Christmas shopper like myself, even the frightening though of wrapping paper and Sellotape is banished for another year. Take a look at www.finickyshirts.com and you might just find all your Christmases have come early.